Come join Steven Mayers to read and discuss the poetry of San Francisco’s first Latino Poet Laureate, Alejandro Murguía! The group will meet on Wednesdays 9/10, 9/17, and 9/24, from 4:30 to 5:30, in the Rosenberg Library at City College of San Francisco, R205E. 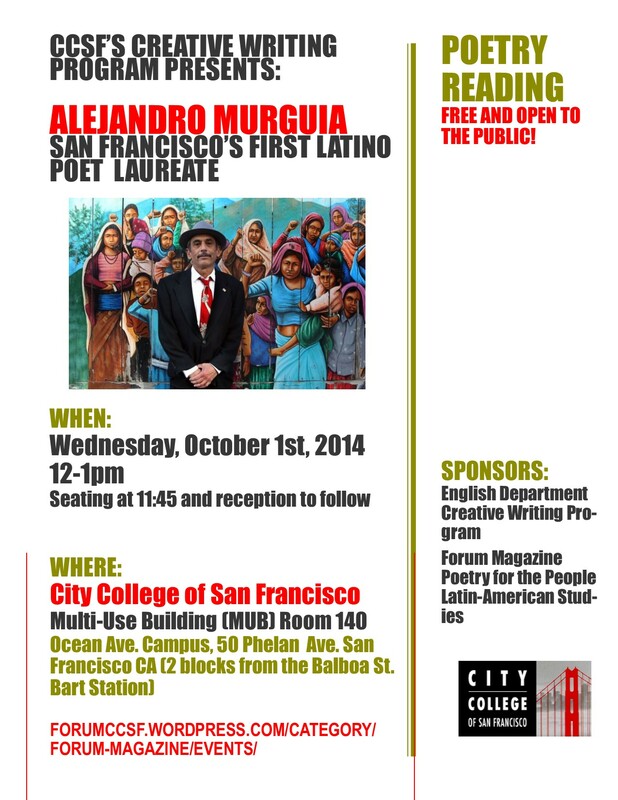 On Wednesday, October 1st, at 12:00, CCSF’s Creative Writing Program and Forum Magazine will be hosting a reading with Alejandro Murguía . The reading will be held at the main campus of the City College of San Francisco, in the Multi-Use (MUB) Building, Room 140, at 50 Phelan Ave., San Francisco, located two blocks from the Balboa Park BART station. Limited parking is available on campus. The reading will take place on Wednesday, October 1st, at noon. Seating begins at 11:30. A Q and A session will proceed the reading, with reception to follow. This event is FREE and open to the public. 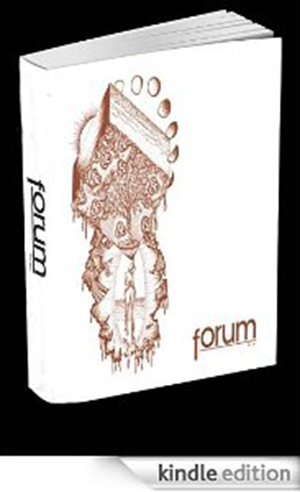 Murguía’s poems weave together English and Spanish, along with themes such as history, politics, race, culture, and love. His publications include two collections of short stories, Southern Front and This War Called Love, a collection of poetry entitled Stray Poems, and a work of creative non-fiction, The Medicine of Memory. A two-time recipient of the American Book Award, Murguía is a founding member and the first director of The Mission Cultural Center, a founder of The Roque Dalton Cultural Brigade, and co-editor of Volcán: Poetry From Central America. He teaches at San Francisco State University. The reading will be held at the main campus of the City College of San Francisco, in the Multi-Use (MUB) Building, Room 140, at 50 Phelan Ave., San Francisco, located 2 blocks from the Balboa Park BART station; limited parking is available on campus. The reading will take place on Wednesday, October 1st, at noon. Seating begins at 11:30. A Q and A session will proceed the reading, with reception to follow. This event is FREE and open to the public. You can visit the Facebook invitation here and invite more people! We’re thrilled to announce that English 35LM, Literary Magazine Production, will run this fall as planned. We’d love to add a few more editorial staff, so now is the time if you are considering! Also, the Design Studio Practicum class, VMD 200A is looking for more students interested in the design end of Forum production. Contact Colin Hall, chall@ccsf.edu, for more information. Our submissions deadline for the Fall 2014 issue is September 26th. Please be sure to review the submissions guidelines to ensure your submission is reviewed in a timely fashion.